AK-47 is an award-winning masterpiece of cannabis strains, and rightly so because she brings forth the most favored traits from both Sativa and Indica worlds. As a matter of fact, AK-47 is the only strain that has earned awards for best Sativa and best Indica. Most cannabis aficionados have likely heard about AK-74, the award-winning cannabis classic that is still very popular today. Considered a true masterpiece of cannabis strains, she provides marijuana connoisseurs with the best of both indica and sativa, in one rewarding hybrid. Some of the best qualities of the strain are her superb high, complex flavour profile and good yields. She has won countless awards, at times crowned as best sativa or best indica. The sativa-dominant hybrid delivers a powerful and long-lasting effect that is very relaxing, along with a nice cerebral buzz that makes you feel happy and creative. This makes AK-47 a great strain to stay alert and engaged in social activities. With her mellow high and her mood-lifting properties, she’s also a good choice for users who need help with anxiety or chronic pains. The balanced effect of AK-47 is one great trait, but she is also superb when it comes to aroma and flavour. Her scent mixes mainly acidic and earthy aromas. But when smoked, you can also taste other enjoyable flavours, including floral notes and hints of wood. What makes AK-47 an all-time favourite among those who like to grow cannabis, is that she is also one of the easiest and quickest-growing among sativa-dominant strains. 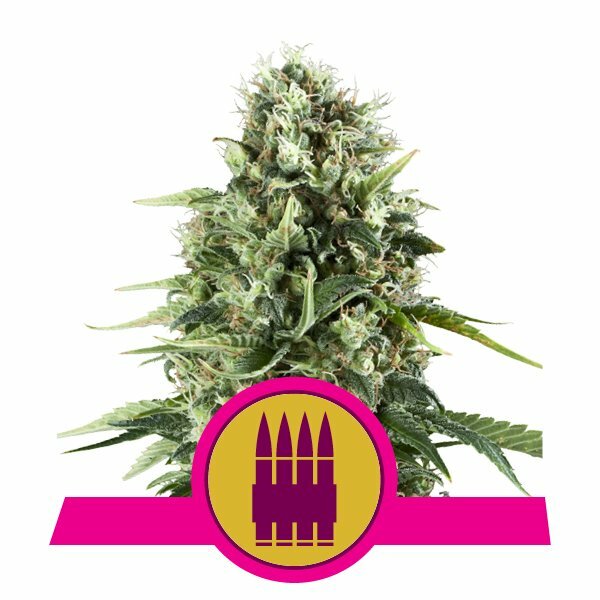 Her robust growth and the reliable yields, which give the strain excellent production value, have made AK-47 a staple strain among indoor growers everywhere. The lineage of AK-47 is believed to go all the way back to Thai and Afghani crosses of the 1970s. The strain itself, however, didn’t come into existence until the early 1990s, and saw further improvement in 1999, so that it can produce more uniform seeds. The breeders used Colombian (sativa), Mexican (sativa), Thai (sativa) and Afghani to make AK-47. The result was a sativa-dominant hybrid, with 65% sativa and 35% indica heritage. Back then, the THC content of AK-47 was considered quite high with 13–20%, although compared to more recent strains this is now considered average. Her CBD and CBN percentage sits at a decent 1.5%. It didn’t take long for her to become one of the most celebrated cannabis varieties. She won countless cannabis awards because of her great effect, and for her excellent flavour and resin production. Contrary to what her name my may suggest, AK-47 isn’t a strain that will knock you out. Thanks to her sativa side, she delivers a euphoric cerebral high, with a mellow physical stone. This makes her ideal as a daytime strain and a great social smoke that is a lot of fun to share. When you use her, you can still function and go about your day. But at the same time she is also very soothing and relaxing, and puts you in a good mood. This makes AK-47 a good choice if you want a smoke just to have a good time, or if you want to get rid of stress and anxiety, no matter the time of the day. With her pleasant effect, she is also a favourite for medicinal users, helping with chronic pains, eating disorders and insomnia. The complex flavours of AK-47 are yet another reason why so many love the strain. She has sweet and earthy Kush notes that she mixes with tastes of rubber, floral notes and hints of wood. The scent of AK-47 is intensive yet pleasant: she blends earthy notes with zesty hints of pine wood, together with subtle citrus aromas. The result is a dank, somewhat skunky and spicy aroma that thanks to citrus notes is also enticingly refreshing. Unlike some other, newer strains, AK-47 doesn’t really form a thick layer of trichomes. She makes up for this with her very large buds that, due to their shape and size, some compare to small bananas. She sports nice colours as she grows, her lime-green buds contrast with her orange pistil hairs, giving the plant a classy (and classic) look. Some phenotypes of the plant can also turn shades of purple. AK-47 has always been a top choice, in particular for indoor growers, but that’s not to say that you wouldn’t be able to grow her outdoors. Among qualities that make her an ideal strain for growers is her quick flowering time. The average of about 60 days is rather short for a sativa-dominant plant. If you plant your seeds outdoors, she will need about the same time to go through bloom, and she will be ready to harvest in mid-October. The AK-47 strain adapts well to all kinds of growing environments, which means you can grow her in soil, in coco or in hydro, and you can pretty much always expect good results. She is also an excellent plant that responds very well to pruning, and is very good for those who can grow her in a SOG to maximise yields. There is not too much to growing this lady, but there are two things that you need to be aware of. One is her very pungent scent. So if you grow her in a location where smell could be an issue, make sure that you have good air filtration in place. The other thing that growers should be aware of with AK-47 is that she is a bit more sensitive to high humidity levels and mould, due to her large, dense buds and high resin content. To keep the risk for mould low, you should make sure that your growing area is well ventilated. Since humidity levels can’t really be kept under control when you’re growing outdoors, this can make AK-47 a bit challenging in an outdoor environment, in particular in humid or rainy climate. She’s a good outdoor strain to grow in climate such as the Mediterranean, but would be less ideal to grow outside in northern climates, where the weather normally turns bad at the end of summer. If you grow our classic feminized AK-47 variety, Royal AK, the plant will grow to a height of 80–140cm, which means that she will fit into most of tent sizes and grow rooms. Outdoors, the plant can get as tall as 170cm. With 19% of THC, she is potent enough so that you can enjoy its great effects. Some growers prefer autoflowering varieties of AK-47. After all, autoflowers can make growing weed easier, since you won’t have to worry about light cycles. You can just plant your seeds and simply leave your lights at a fixed 18–20 hours per day, all the way to harvest. Autoflowers are also good if you want to plant cannabis outdoors, between seasons, since you won’t be relying on certain times in the year for planting or harvest. 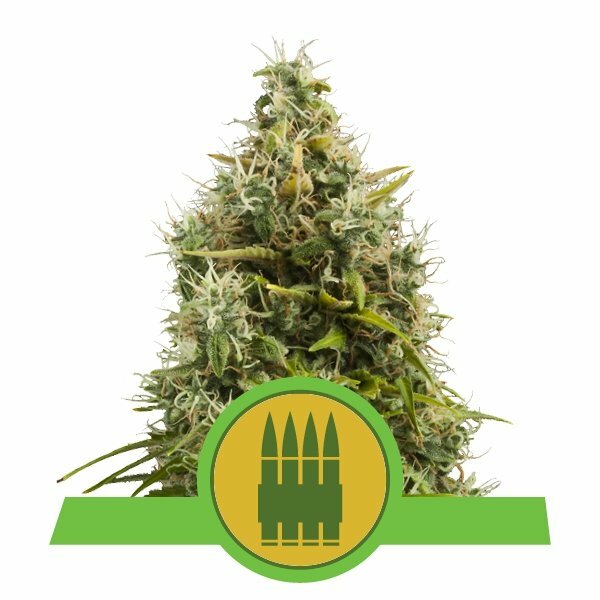 At Royal Queen Seeds we have upgraded the classic AK-47 to Royal AK Automatic that can provide you with all these advantages. And just like the original, Royal AK Automatic will provide you with the legendary happy high, with just a slight body stone, and please you with her very good resin production and a great taste. Our autoflowering variety of AK-47 grows even faster, so that you can harvest her in 9–10 weeks after you have planted your seeds. The plant grows to a compact 60–100cm which makes her ideal for growing indoors, even if space is an issue. With 15% of THC, she is only slightly less potent than her feminized sister. 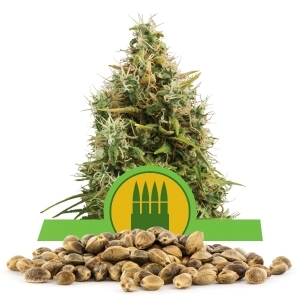 You can look forward to harvest as much as 160g per plant with our Royal AK Automatic! AK-47 is still as great today as she had been when she came to the scene in the early 1990s. After all, what makes a true classic is that they never go out of style! 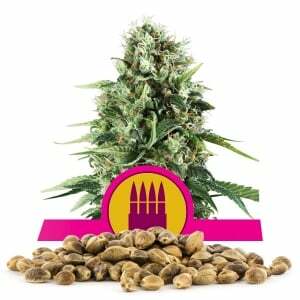 At Royal Queen Seeds, we carry AK-47 in the classic feminized version, or as a convenient autoflowering variety. No matter which variety you want to grow, rest assured that AK-47 never disappoints!